Download Demo Project (39.18 KB) * Warning, externally hosted. Download Source (8.2 KB) * Warning, externally hosted. This article presents an extension of the .NET ComboBox which provides custom drop-downs. The control can automatically add a resizer grip at the bottom of a drop-down. Custom drop-down functionality can be achieved using the .NET ToolStripDropDown and ToolStripControlHost classes. These two classes are great because they prevent application forms from becoming inactive during drop-down. 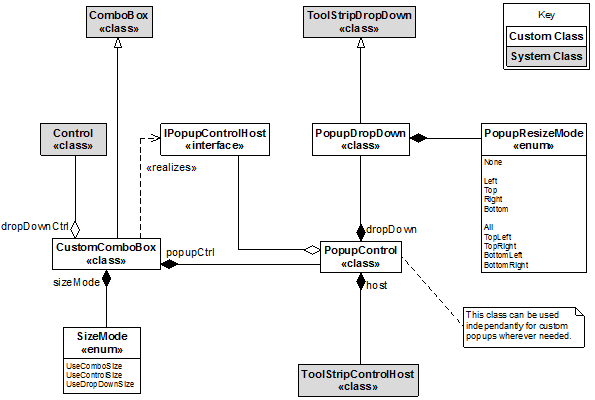 The custom popup functionality required by this control has been encapsulated within the class PopupControl (a new addition since the original article posting). In addition to facilitating this control, the PopupControl class can be used to provide drop-down support in your own controls. The PopupControl also integrates the drop-down resize support (now without the need for a nested resizable container, see below for details). Previously the drop-down control was resizable by nesting a resizable container. This was an okay solution (because it worked) but it caused some redraw errors during resize operations. The resize functionality has now been significantly improved, and it is now also possible to define which sides of the drop-down are resizable (if any). Resizing can now also be done by dragging the resizable edges of the drop-down. The new resize functionality is achieved by intercepting Win32 hit testing messages, and responding appropriately based upon the set PopupResizeMode property. As with most controls, this control can be created dynamically at runtime, or by using the Visual C# IDE designer's drag and drop features. During runtime, the property DropDownControl must be assigned to an instance of another control. The assigned control must not be contained elsewhere as this will cause problems. Most drop-down controls appear better when their borders are removed. 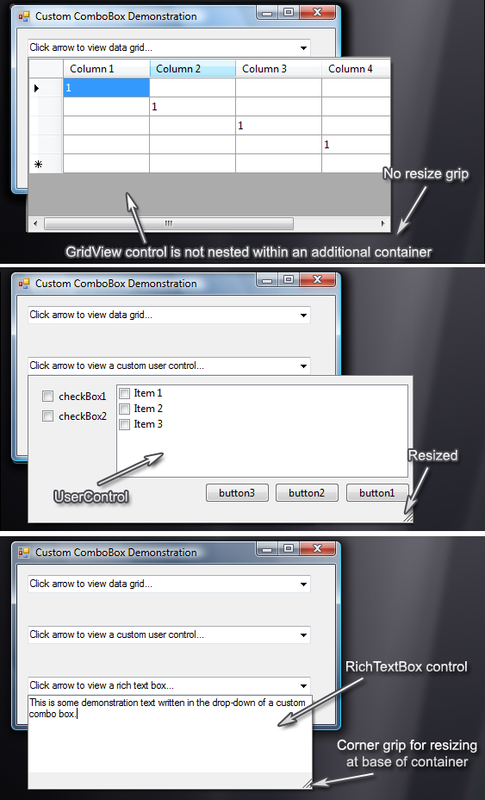 // Create grid view control. // Create rich textbox control. This is an article which I originally wrote and posted at the CodeProject website: http://www.codeproject.com/KB/combobox/CustomDDComboBox.aspx.